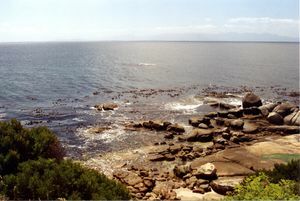 The dive site Spaniard Rock or Rocklands Point is an inshore rocky reef in the Rocklands Point area on the False Bay coast of the Cape Peninsula, near Cape Town in the Western Cape province of South Africa. A high, steep sided and flattish topped granite pinnacle that extends a few metres above the water off Rocklands Point. It is the only rock of this desctiption and is unmistakeable. Maximum depth is about 13m on the sand beyond the rocks. The water gets deep quite quickly on the south side of the entry area. The smaller pinnacle to the west extends just above water at mid tide, and is awash at high tide. There are several other fairly large boulders around it and to the south the bottom of coarse shelly sand is at about 10m. A gap of several metres to the east separates this group from Spaniard Rock proper, which is very sheer on the south and east sides, down to a sand bottom at 11 to 12m. There are a few low outcrops further East, and bigger boulders to the north. Suitable if entry conditions are OK. Best if sea is flat or swell very low. Usually considered a winter dive site, and is sheltered from westerly winds and swell. 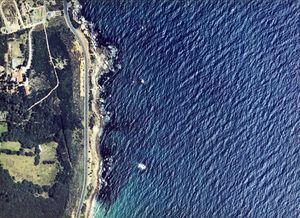 The site is exposed to south easterly winds and waves, which could cause exit conditions to deteriorate during a dive. If this happens, consider the longer swim to the more sheltered north exit area. Parking at the side of the M4 on a wide gravel verge near a sign warning against feeding baboons. Traditionally a shore dive, but not dived as much from the shore as it used to be. There is adequate parking on gravel shoulder on seaward side of main road, near the signpost warning against baboons. Access to the shore is poor. There are several steep eroded paths, some worse than others. Choose the one that looks best on the day. All are slippery and steep, with loose gravel. If you have a large group it may be worth arranging a rope for safety, otherwise a walking stick or staff would be useful. The climb from the roadside to the rocks is the worst part of the exercise as it is steep and slippery. The exit point to the north of the little promontory is good, entry to the south could be a bit shaky if swells are running, but if it is too rough, it is probably not a good day for a shore dive at this site. 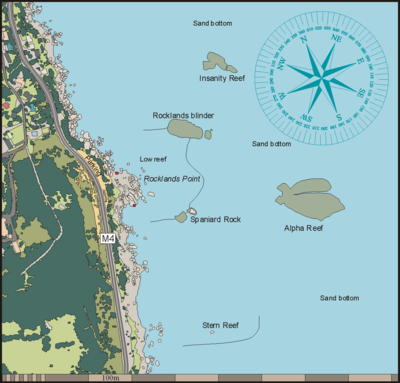 The northern entry point at Rocklands Point. The alternative exit is the north entry and exit point, which is more sheltered, but a significantly longer swim. Make your choice on the day to suit conditions. Dense kelp forests close inshore, thinning out with depth, and colourful encrustations of invertebrates, particularly on the steep and overhanging surfaces in the deeper areas. Entry at the flat rock facing Miller's Point. Surface swim to inner pinnacle, descend, dive round the group of rocks, then west to the main pinnacle, round the main pinnacle then on a compass course to exit at the north entry and exit point. On the way back to shore on 300° magnetic there are a number of big boulders and then gullies and ridges leading into shallow water. These must be avoided and passed round to the north. Keep in water deeper than 5m with the slope up to your left to stay out of the worst of the surge until you get to the exit area, which is beyond a large smoothly sloping rock surface encrusted with nubbly encrusting corallines, colonial ascidians and sea urchins, with scattered kelp, then stay in the middle of the gap for the easiest exit. The path is steep and slippery and usually in poor repair. No special skills required for the dive. Some fitness and agility is required for the climb down and back up to the road. A suitable site for competent snorkellers. A light will be useful to look into crevices and overhangs, and a compass will help to navigate back at the end of the dive. This page was last edited on 26 November 2010, at 14:56.